So You Think You Can Mom? : Spring Cleaning Made Easy with the Shark Rotator Powered Lift-Away! Spring Cleaning Made Easy with the Shark Rotator Powered Lift-Away! It's finally Spring! For me, Spring means it's time to get organized and really give the house a good cleaning. Clear up some clutter and get into places that may have been ignored over the Winter. Between running around all day from school to baseball practice for 3 kids and rushing to get homework and laundry done in the evenings, I tend to overlook vacuuming for a few days...ok, weeks. Let's keep it real! When that happens my floors look crazy! I have gone through quite a few vacuums over the years after having my children. I may or may not have sucked up a LEGO or two! With all of my previous vacuums my complaints have always stayed consistent. Loss of suction strength and the lack of versatility. My home has stairs...a lot of stairs. From the 1st floor to the 3rd floor and it's not fun for me to haul my dino-vac up and down the stairs trying to get the house cleaned. I'll admit it, most of the time I just vacuum downstairs and ignore the stairs and bedrooms. Shame on me! Before I know it the stairs look like an obstacle course of debris and the bedrooms are suffering. That's why I am so excited to tell you about my latest and greatest discovery. The Shark Rotator with Powered Lift-Away is an amazing helper. "The patented innovation of Shark Lift-Away takes the cleaning power of the Rotator anywhere dirt tries to hide. Clean from the floor to ceiling and anywhere in between with the power of Lift-Away." The swivel design of this vacuum makes my life so much easier. It literally fits under the tables, around the couch and into most hard-to-reach areas of my home. Vacuuming downstairs was a snap. The true test was taking this bad boy upstairs. 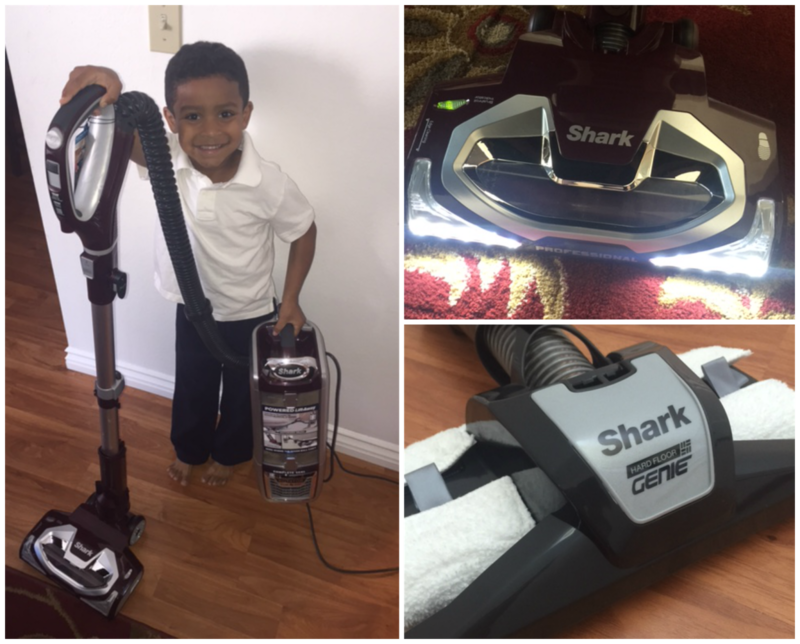 The Shark Rotator transformed from a standard upright vacuum into a 2-piece Lift-Away in one swift click and I was off to battle! The rug under my dining table always ends up with crumbs following every meal. Cereal, veggies, noodles, you name it...you will find it under there! By the time my kids were done vacuuming the rug it looked brand new and my kids really like the bright lights! I also have hardwood floors and the Shark Rotator comes with an awesome attachment called the HardFloor Genie and it was just perfect on my hardwood floors. This is the first time my kids have actually wanted to help me clean up around the house and who I am to say no?!?! Even my youngest got it on all the Spring Cleaning Fun! Before I knew it we were all having fun and our floors have never looked better. Thank you Shark Rotator! Start the pressure washer and aim it in the air away from any people or pets in the area.Use both hands to hold the pressure washer and get used to the recoil as the water is expelled. I'm glad to find out your blog post about Vacuum cleaners. Thanks for this post. Thus, this waste-sucking receptacle by Jun-se Kim, Yonggu Do & Eunha Seo that does the dirty work for you, pulling dust in from all sides via an internal electric motor (powered by a plug-in, wall-socket-friendly cord).